By February 21, the Franklin was ready to be thrust into the battles of the war that were pushing the Japanese back to their mainland, island by island and cave by cave. 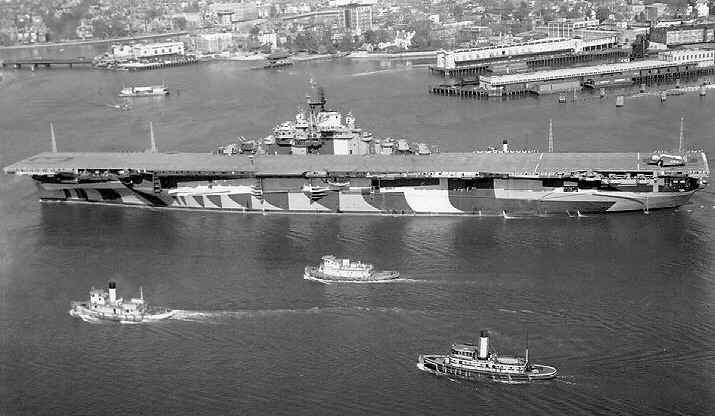 That day as the tugboats eased the immense carrier into Hampton Roads and Chesapeake Bay, her Captain, James Shoemaker, and her crew did not imagine that their beautiful lumbering giant of a ship would sail and fight through one hundred and two thousand combat miles, participating in five major pacific campaigns. Franklin's fighters, bombers and torpedo planes would down hundreds of the Japanese Empire's war planes and dozens of Japanese ships. But no one knew that morning the ultimate fate that lay ahead for the Franklin on March 19, 1945; the day on which the journey would end for 835 of her crew. The day which would be somberly commemorated each year by the men who pulled her from the precipice of destruction.